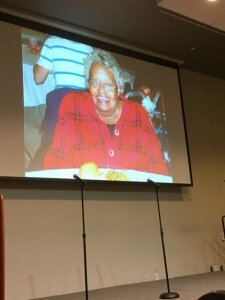 A photo of the late Lillie Mae Brownlee, winner of the Unity Award, was shown on the screen. Photos by Martha Hayden. 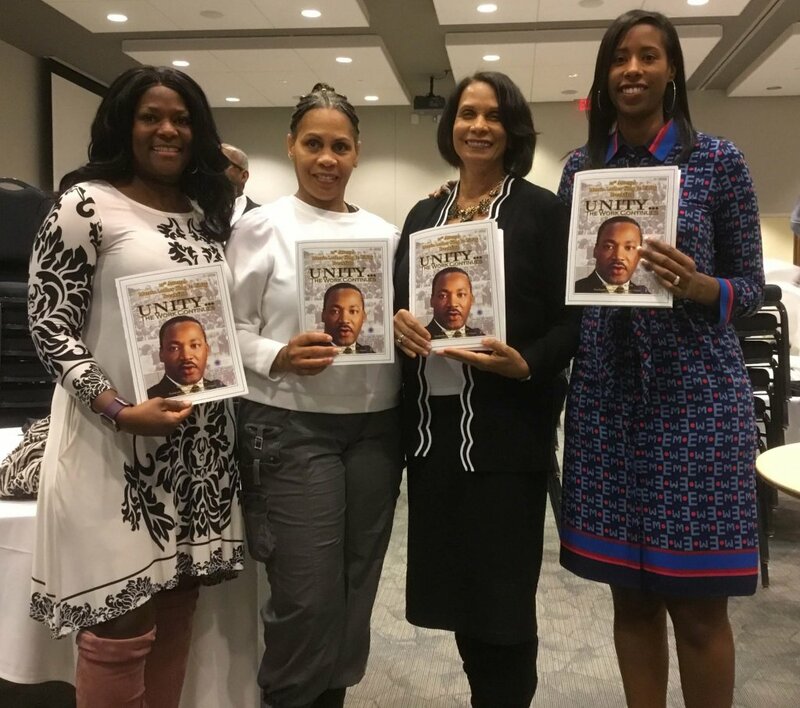 Lillie Mae Brownlee was named the recipient of the 2019 MLK Unity Award during the 21st annual Martin Luther King Jr. Unity Breakfast in January at the Northside Hospital Cherokee Conference Center. Brownlee, who passed away at age 93 in November 2018, was given the award posthumously for the legacy she left Woodstock and Cherokee County. She was one of the oldest and longest-serving members of Allen Temple AME Church in Woodstock at the time of her death. 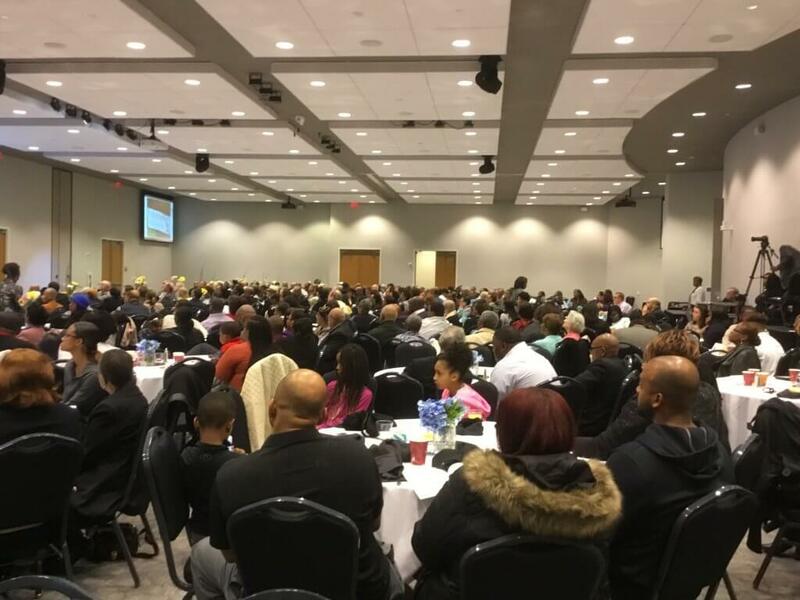 The annual event recognizes the legacy of one of America’s greatest civil rights icons and draws approximately 500 residents from all racial, political, social and religious backgrounds to promote unity among the citizens of the county. This year’s keynote speaker was Bishop Philip N. Cousin, Sr., a friend and classmate of Dr. Martin Luther King, Jr. Mistress of ceremonies was Ebony Steele, national radio host and TV personality. • Work in the Community: Bishop Charles Gearing, Jr., who was instrumental in getting a street named after Dr. Martin Luther King, Jr. in Canton. • Work in the Churches: Concerned Clergy of Cherokee County (C4), Rev. Mike Saunders, president. • Work in Schools: DREAMS Organization of Reinhardt University. From left: Crystal Terry and Monica Graig with Hands in Praise Dance group, which performed at the event; the Rev. Sandy Pace, planning committee member and director of ministries at Allen Temple, and her daughter Kristen Pace Furlough.